Initially was keeping one eye on Perth Marathon on 20/06. 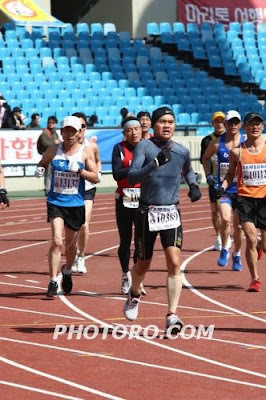 But after doing some maths: 4 weeks to recover/re-build from Seoul, then another 6-7 weeks of training, I think the improvement from training is likely to be minimal due to the short, half-baked marathon prep again. Anyway, I've done too many 8 weeks marathon preps in my life! Gold Coast in July is not an option due to my bro's wedding. So, that leaves Melbourne on 10/10/10 as the most viable option, six months way from now. Review from last year wasn't that great though, with lots of sub-3 and low 3 marathoners bumping in a great wall of HM/10k runners, so let's hope the organizer can fix that. Plan to do some short races in the next 1-2 months. Hopefully, the racing and training will keep me to stay motivated. An October marathon is such a long way to go. Anyway, running has been really minimal since the marathon. Took one week off after the race and started doing 30-40mins runs during the second week. SW seems to take marathon recovery seriously and honestly, I was a tad worried that I won't be able to leverage on the marathon fitness due to the lengthy period of inactivity. It is surprising that although, I didn't feel wasted after the marathon, I found it hard to get going running in Singapore again. Legs were stiff and it was simply not fun to be drenched in sweat again. On Good Friday, I did 1hr+ run and it felt like I was doing a marathon. Probably it's wise to take a longer post-race recovery this time since the marathon is still gonna be 6 months away. Past experience seemed to agree with this. Following last year's Gold Coast marathon, I did a 8k race just a few days later then jumped straight into 5 weeks of hard training to get ready for the Army HM. 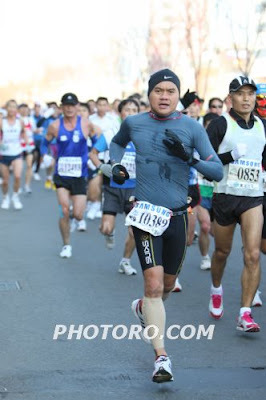 At the race, I could only run the HM at my GC's marathon pace !! This looks like a scene taken from 3000m race. But it's actually the last 300m of the marathon inside 1988 Olympic Stadium. Starting marathon temperature was 0c. I hardly sweat at all - the wet marks on the front of the shirt was due to drinking water spill. Cool photos. Sounds like a good plan, will see you in Melb. Try and get in at least a couple of HM's in beforehand. Thats one cool piece of headgear. Thats awesome that you got to finish in the 1988 Olympic Stadium...way cool! I'm happy you are going to Melbourne. See you out there. Hopefully it all works for you on the day, and hopefully the problems with the HM backmarkers clash isnt a major issue for you. Its not GC but its still a very fast course, and the opportunity is there for the taking for a big PB. Long sleeves, gloves and hat show how cold it was! Good shots, and yes, out in lane 3 to finish a 3000 race! Agree with your idea about Melbourne. Good SW recovery, then some other racing and a proper build for 10/10/10.